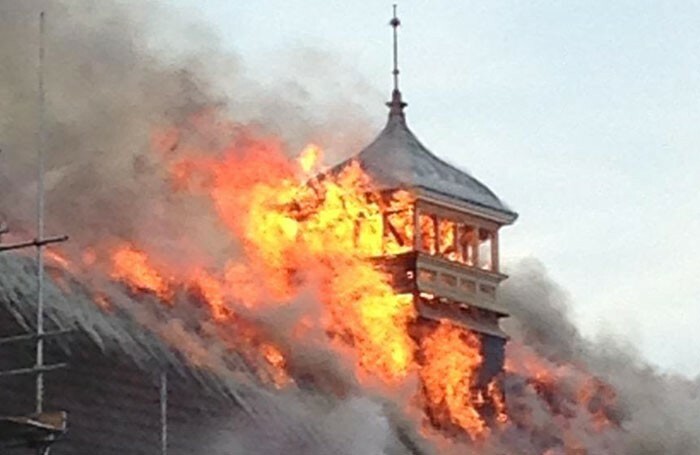 A large fire has broken out at Battersea Arts Centre, resulting in the cancellation of performances tonight. The venue confirmed via Twitter that everyone in the building was “out safe” and that fire brigades were working hard to “get the fire under control”. According to a spokesman for the London Fire Brigade, eight fire engines are currently on the scene, dealing with the blaze. He said that 58 fire officers were tackling the fire, and that the fire service had been called just before 4.15pm this afternoon. The spokesman added that it was too soon to know what had caused the fire, but said smoke from the blaze could be seen across London. The Battersea Arts Centre is currently in the final phase of a £13 million redevelopment project, which includes plans for the creation of a new lift, a new outdoor performance space and a large performance space made up of 12 linking rooms.